If you are a current employee, we welcome you to visit our Internal Career portal available via ConsulNet. Please click on the Career Search tab to review current openings. Consulate Health Care has earned a reputation as a leader in a dynamic and rewarding industry. The strength, stability and tenacity of our leadership have allowed us to grow, giving us the opportunity to serve more communities and hire more talented professionals like you. Compassionate hearts and passionate dedication – these two qualities shine in our team members and provide the foundation for our mission of "Providing Service With Our Hearts and Hands". The compassion you'll show to residents, patients and their families is the lifeline of our business, while relationships with your peers and coworkers will strengthen our vibrant, diverse community. We invite you to use your unique experience and talent in a career with Consulate Health Care. Our caregiving employees are the heart of what we do. We are united in our mission of "Providing Service with Our Hearts and Hands", and we understand the importance of caring for our patients and residents like family. Together with your fellow nurses and directors, we create a culture that provides a unique environment for our patients and residents. We care for them like loved ones, taking the extra measures to create the comforts of home. Without you, we wouldn’t be able to create this special community of compassionate caregivers within our Consulate Health Care family. We remain committed as ever to our employees, and your dedication and passionate spirit will help us grow and expand, creating career opportunities for you to advance and succeed in your chosen career path with us. Our environment allows you to work among peers, which creates a companionship that strengthens our community and reflects the way we are able to provide care – by treating our patients and residents like loved ones. The respect and compassion you'll show to our residents, patients and their families is the lifeline of our business. 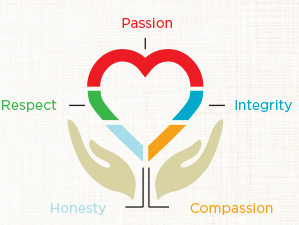 Compassionate hearts and passionate dedication – these two qualities shine in our team members. Our employees are Ambassadors of Care and the driving force behind our success in delivering patient-centered care. Does this answer your calling? If so, we invite you to use your unique experience and talent in a career with Consulate Health Care. Explore our currently available positions and apply today. Consulate Health Care is a national leading provider of senior healthcare services, specializing in post-acute care. Operating more than 200 centers nationwide in 21 states, we offer services ranging from comprehensive short-term rehabilitation and transitional care to Alzheimer’s and dementia care. At Consulate Health Care, we are leaders in short-term rehabilitative programs, and as such, we get people home faster. Acute illness can shake a family with overwhelming dread and instability, and it’s times like these when people reach points in their lives where they must depend on others. At Consulate, we understand that getting home and staying out of the hospital means more time with family at a moment when time together means everything. Consulate Health Care began as a small provider in Cheswick, PA with a strong focus on patient needs. We haven’t waivered from that focus, which has strengthened our family and allows us to sustain jobs in many communities, create rigorous systems of care and deploy technology that makes it easier to understand patient needs. Even as we’ve grown to become the sixth-largest provider in the nation and the largest in the Sunshine State, it’s the little things we do while fulfilling our mission statement of “Providing Service with Our Hearts and Hands” that really make the difference. From talking with our patients while they eat to ensure proper nourishment, to pulling up the sheets to just the right height, our employees care for patients like family, not because it’s their job, but because it’s their calling. Respect: "a high regard and esteem for others"